* Under The Skin by Michel Faber. The less you know about this sci-fi thriller the better, because this well-written novel in which a mysterious girl picks up hitchhikers is full of surprises. Scarlett Johansson will play the lead in Jonathan Glazer's movie adaptation. * Chi's Sweet Home 6 by Konami Kanata. A cute Japanese manga series about a cat. * The first season of Boardwalk Empire. Intelligently made chronicle of the life on Nucky Thompson who was equal parts politician and gangster. Memorable actors and set design. * Vanishing Waves (2012). A dreamy and visually stunning Lithuanian film about a neuron-transfer scientist who experiments with the thoughts of a comatose woman. * Amour (2012). This French film about an elderly couple's last days together mirrored my grandparents' current situation and how illness severely tests their bond of love. The film taught me that when in the same circumstances, many people act alike and say the same things. Amour was so true to reality that I was certain that Michael Haneke's inspiration was autobiographical (I looked it up and it was inspired by the suffering of an aunt, crippled by rheumatism at the age of 92). I can already say that Amour will be one of my favorite films of the year. * Paranormal Activity 4 (2012). Not sure why I watched it considering I disliked the previous episodes. * American Mary (2012). Canadian film about a medical student who ends up performing underground surgeries for easy money. It felt forced and silly and I don't understand the rave reviews the film gets. * The Conversation (1974). A paranoid surveillance expert goes through a crisis of conscience when he suspects that the couple he is spying on will be murdered. Stylish, intelligent and subtle; this is Francis Ford Coppola at his best. * Kotoko (2012). Tsukamoto's latest is a trip (literally) into the mind of a psychologically unstable woman. A fascinating watch, but not an easy one. Ludovico Einaudi, Eliane Radique and Philip Glass. I also went to a concert of The Bersarin Quartett and a mesmerizing audiovisual performance of Murcof and Simon Geilfus. pretty sure that is the most amazing space ever! I want it! Under the skin sounds like an interesting read. Not sure I'd enjoy Boardwalk Empire, but I've been tempted to watch an episode. I missed the first season of Boardwalk Empire because I was traveling when it came out so now I can't watch any of the later seasons without catching up. *groan* But I've heard it's excellent! Nice to meet you, Vanessa. Paranormal Activity - know when to say when! Watching the Super Bowl this weekend and reading a book by Ali Cross. Okay, I'm reading Double Crossed by Ally Carter. I'm listening to "Zombie" by The Pretty Reckless, and I'm watching last night's episode of The Vampire Diaries since for some reason I didn't realize yesterday was Thursday and I missed it. Thanks for dropping by, Vanessa. I'm too easily spooked for most of your reading and movie lists, and the non-scary stuff doesn't interest me. I'm reading Shadows in Winter by my friend, F J Fuller and listening to Allison Kraus these days. Wow that's an amazing picture! 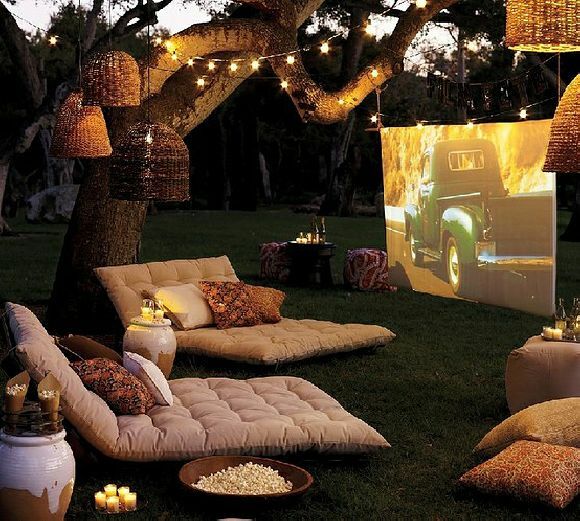 I would love that in my backyard! Thanks for dropping by my blog earlier. That entertainment area is to die for. I'm reading My One Square Inch of Alaska by Sharon Short, which isn't paranormal or even my usual mystery, but a wonderful story. I am currently re-reading The Hunger Games. There is a love triangle, but it is never the focus of the books. They're about power and rebellion, and most especially the costs of war - Katniss and her relationships with Peeta and Gale are tied in with that. Like, the love triangle serves to further illustrate Collins' themes and Katniss' internal struggles. Is that your backyard? WOW!! Amazing!! Vanessa I just wanted to very genuinely thank you with all of my heart for being one of my biggest inspirations out there. Each one of your stories is amazing and perfect and I love every word. I know you have to hear this literally all the time but I'm hoping to be a published writer one day and you and your stories really motivate me to pursue my dream and never give way. Honestly. So, please, just keep being you and keep up the amazing work. I haven't heard of this book. I'm curious to see the movie. I laughed all the way through Paranormal Activity and do kind of want to see the others, but I heard they are so bad. I guess the premise and ads look good so I want it to be better. That picture is Heaven on Earth isn't it? Here from the weekend showcase hop aending BB2U. Reading: Devil in the White City and Heather Wells Book 2. I was watching the Superbowl. Now I'm just watching my random YouTube shows that I enjoy. Listening to the sound of the wind. It's trying to build up to rain out there. Have you ever lost your phone? It's awful feeling. But I was lucky to find it thanks https://cellspyapps.org/track-phone-number/ So I can recommend it to you now.